Living deep within the forests of the Pacific Northwest, Ben Cash (Viggo Mortensen) is devoted to raising his six children with rigorous physical and intellectual education. However, a family tragedy forces Ben to leave his paradise and enter the 'real' world, challenging his idea of what it means to be a parent. On the surface, Captain Fantastic appears to be a familiar tale of off-grid family life. We’ve seen these movies before - we know their conflicts, we can predict their messages. However, director Matt Ross has a more meaningful goal in mind. As a result, his hugely entertaining film is also extremely thought-provoking with surprising comedy, depth and nuance. At the heart of Captain Fantastic lies the mystery of Ben Cash. In a superb central performance, Viggo Mortensen conveys both sides of this complex character, leaving us to question whether Ben is a remarkable, inspirational parent or an irresponsible and dangerous father. Ross offers no easy answers. There are no obvious heroes or villains here. As in real life, everyone has shades of both. Mortensen is ably supported by an impressive cast. Frank Langella and Ann Dowd bring depth and compassion as Ben's inlaws. Meanwhile, the Cash children are portrayed by a remarkable group young are actors - each destined to be stars of the future. Kathryn Hahn and Steve Zahn provide comic relief as parents struggling to protect their children from painful truths. Ben’s brutal honesty is refreshing in these scenes and yet (thankfully) Captain Fantastic does not encourage us to judge or condemn any parenting style. It is all food for thought. Indeed, the themes that the movie explores (the value of education, our relationship with nature, the importance of individualism) linger long after the film has ended. Stéphane Fontaine’s cinematography is stunning in Captain Fantastic. Matt Ross makes wonderful use of sound in his film. There is as much beauty in the sounds of nature (particularly bird song) as there is in the sounds of the music played by the Cash family. I loved their version of the Guns N’ Roses classic, Sweet Child O’ Mine. I also loved Kirk Ross’ version of Bob Dylan’s I Shall Be Released (which accompanies Captain Fantastic’s end credits). 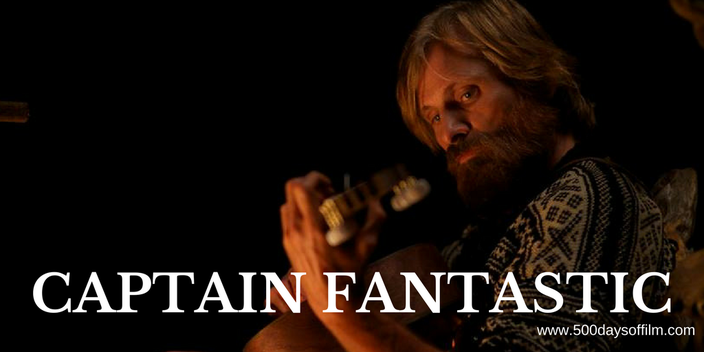 Have you seen Captain Fantastic?